Humans consider themselves as the tool user par excellence. Previous work comparing human tool use skills to that of other species tended to place the animals in artificial conditions far removed from their natural environments. Such comparisons disadvantage the animals and lead to underestimating the tool use demonstrated by wild populations. In a first comparison between individuals of two groups of humans and chimpanzees cracking nuts in their natural environment, researchers recently tested how quickly and how completely a technique was acquired by the offspring of the two species. The Taï chimpanzees in Côte d"Ivoire, famous for their nut-cracking behavior, were compared to the Mbendjele BaYaka people, who also habitually crack the same species of nuts, Panda oleosa, in the forest of the Republic of Congo. 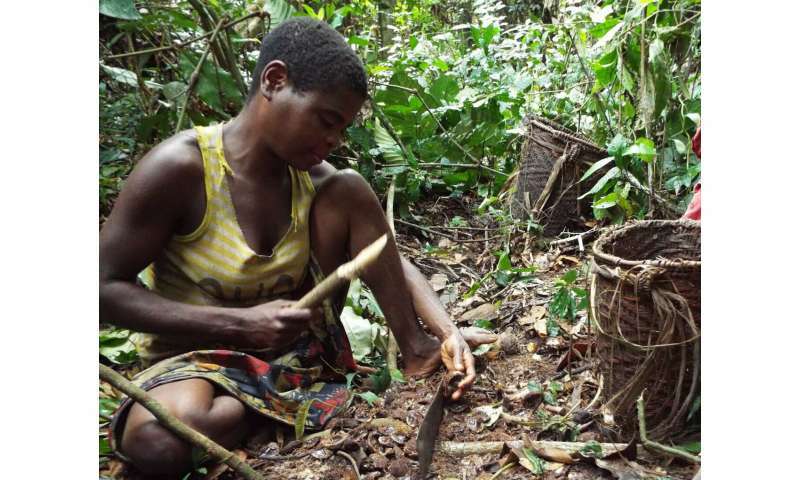 Following Mbendjele women groups as they foraged in the forest, the scientists used the same measures of efficiencies as used previously on the Taï chimpanzees to observe how the technique is acquired by both groups in the forest. In a previous study published in 2017, Christophe Boesch, director at the Max Planck Institute for Evolutionary Anthropology and lead author, and colleagues compared the efficiencies of adult females in both species, revealing surprising similarities in the performances of the two populations, despite the use of different tools—the humans used sharp-cutting metal hammers, and the chimpanzees used stone hammers. In the present study, the "apprentices" of both species acquired the technique initially slowly, with similar kinds of mistakes, such as hitting the anvil directly with the nut, or placing the nut on the ground instead on the anvil, and both techniques required years of practice for expert proficiency. 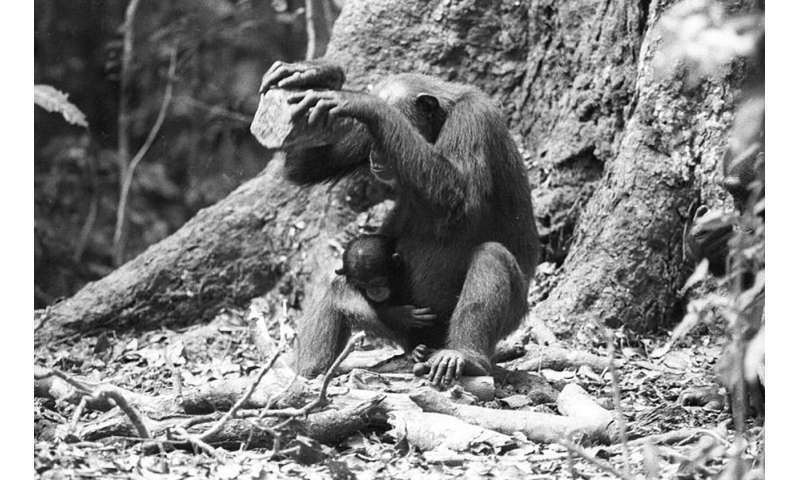 Boesch said, "This study is the first to compare humans and chimpanzees performing the same technique in the forest, thereby ensuring that the two species possess the same level of prior experience with the tools used, the nuts, as well as the potential of observing experts pounding the nuts. In both species, prior experience is key to the acquisition of technical skills." However, even after correcting for differences in speed of maturation between the two species, chimpanzees acquired the technique more rapidly and reached adult efficiency earlier than humans. "Obviously, the Mbendjele people solve more complex technical skills on a daily basis in the Congo forest, but it is intriguing to see that in one technical challenge, the technical skills are acquired more rapidly in chimpanzees than in humans. Nuts constitute an important part of the diet for many months each year for chimpanzees, while they may play a lesser role for humans, and so this could illustrate the power of the environment as a selective pressure for learning skills," concluded Boesch. Furthermore, teaching, which has regularly been proposed as a unique human ability, was observed regularly in both species between experts and apprentices learning the technique. Nut-cracking involves a relatively complex technique employing three distinct objects, the nut, the anvil and the hammer, which need to be arranged and used in a particular way to open the nuts without smashing them. The frequency of the teaching interactions observed in both species supports the idea that teaching facilitates the acquisition of a technique and should therefore be more frequent for complex behaviors in both species. The relatively similar level of teaching interactions in the two species and the more rapid acquisition of nut-cracking proficiency in chimpanzees come as a surprise, given the assumption that humans are generally superior in tool use. The authors stress that both chimpanzees and humans need to adapt to the challenges they face daily in the environment, and the more similar the problems are, the more similar the solutions and cognitive skills both species will develop. Similar natural comparisons in the future will add to the much-needed comparative assessment of the technical skills of the two species and allow assessment of how humans may truly differ in tool use. "Furthermore, teaching, which has regularly been proposed as a unique human ability, was observed regularly in both species between experts and apprentices learning the technique." That was the only point in famed primatologist Robert Sapolsky lists of human uniqueness [ https://www.ted.c...f_humans ] that I found distinctive. And now this expert-apprentice teaching claim, Abstract excerpt: "Expert-apprentice interactions showed many similar instances of teaching in both species, with more variability in humans due, in part to their more complex technique. While in humans, teaching occurred both vertically and obliquely, only the former existed in chimpanzees."